i am in the middle of a two part move. moving once is a huge job but moving twice in one month is unbelievable. i am not complaining though. i am actually right in my element doing the nesting thing. my biggest challenge is not to go over board in the temporary dwelling. i could have a great time updating and decorating this old 1920 style home but i will do my best to refrain. instead, i have been concentrating my time on deep cleaning my belongings that have been in storage for 3 years. it’s a little like Christmas…opening the boxes and realizing that i have several items that i have lived without for so long. it is also a great time for de-cluttering. many of the articles i have read about things that you hold onto and box away state that if you have lived without it for say 6 months…it probably can go without you ever missing it. i quite enjoy the de-cluttering process. there is nothing like a good purge, so to speak. it refreshes me to come to terms with the items i have accumulated that were totally unnecessary and focus on the worthwhile items that will actually make life better and easier. this brings me back to my topic. this may require a little de-cluttering of the heart. i was writing about love before my big move became a part of my busy schedule. i shared that love never gives up (is patient) and is more concerned with others than it is for self (is kind). 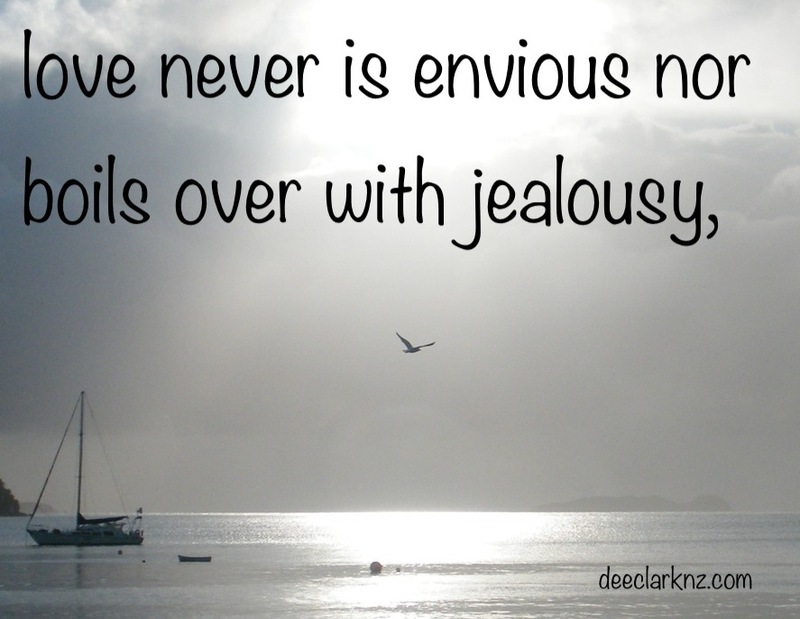 today, lets look at the fact that love is never envious or jealous. no one will go through their life having never felt envious or jealous. these are common feelings that we all experience from time to time. however, if these feelings are not handled correctly and in a positive way, they can cause us to loose our peaceful state of mind or, in exaggerated cases, incapacitate our pursuit of happiness. i learned as a young woman that i did not like the “green-eyed monster” that i could become if i allowed jealousy to take hold of my heart. envy and jealousy are not very pretty attributes. jealousy has a competitive edge to it. this is where those ever-so-famous “Joneses” got themselves into trouble. if you have ever attempted to keep up with the joneses you can understand what i mean by jealousy incapacitating your happiness. this is an excellent way to find oneself deep in debt. the jealousy drives us to compete to be the better person than someone we are jealous of or over. real love is not driven by competition. you and i must first accept ourselves, our situation and our life as it is with confidence. love must first be applied to “me” before i can effectively love outwardly. everyone has some strengths and some weaknesses. my weaknesses can cause me to compare myself and what i have or don’t have with someone else. this leads to discontentment and then jealousy. therefore, contentment is a key element when combating jealousy. our society does not make contentment an easy pursuit. realizing that there will always be someone, somewhere with better looks, skills and talents than i have is the first thing i must come to grips with. there are many things that i would love to be able to do like a pro but can not. i may attempt to improve my skill but understand that if it does not come as naturally to me as my husband, friend or family member this does not represent me as a whole person. i would love to be able to paint beautiful paintings. however, my paintings usually look like my 5 year old grand daughter’s art work. i have decided that if i really want to paint…i should go for an abstract and paint purely for the relaxation and entertainment value for myself. on the other hand, my strengths lie in facilitating, organizing, decorating and many other talents that i truly enjoy and see benefits from. as a child, i was the kid hanging from the monkey bars wishing that it would stretch my body so that i could be taller. sad fact…it never worked. i then spent many years wearing high heels in the most inappropriate times because heels did make me taller but were not functional in every situation. i actually went hiking once in heels…can anyone say ridiculous. i can. i did. i had to come to grips with my body height, shape and looks. accepting myself for who i am, how i was made and what i had to offer was key to obtaining the ability to relax and enjoy the journey that i was on. jealousy also redirects our focus. there occurs an unhealthy attachment to what another person has, is or is doing. when we are focused so intently on someone else’s life we are not able to put the necessary energy into building our own hopes, dreams and goals. envy takes jealousy to a deeper level. envy drives us to want what others have. an inordinate desire for what others have develops like covetousness. once this desire takes root, compromising our life value system becomes easy to do. this is how affairs occur. often a person will decide that having the object of the inordinate desire is vital and taking what is does not belong to them is rationalized. treat the underlying fallacy concerning “me” and “you.” realize and view everyone as equal. everyone has the same wish to be happy and to succeed, and not to be unhappy or to fail. everyone has the same right to be happy and to succeed and the same right not to be unhappy or to fail. the grass is not always greener over “there” – green grass requires work and mowing. too often, we see someone else’s life and assume it is easier than our own life. this is also a fallacy. no matter the journey, there will be difficult paths to walk. difficulties truly are the places where we grow and develop our skills and become more of who we should be. just because someone else seems to have a better path…be careful…you and i may not enjoy walking the journey they have made to get to where they are. anything that i must cling to in order to retain it might not be meant for me. i see so many single women who attempt to cling to an abusive boyfriend because they do not want to loose the relationship and be alone. therefore, jealousy and envy drive them to unflattering behaviours. if i could open my heart and give one gift to the single women in the world, it would be the ability to see that they are worthy of respect. please do not allow someone to treat you like you are worthless. you are valuable and if a person can not see and value that in a dating relationship…let go…don’t tie yourself to someone who disrespects you. note: marriage does not fix this poor attitude in a mate! in a committed relationship like marriage, when there is cause for jealousy presenting itself…look for a deeper problem and work to fix that. jealousy is usually a warning sign. don’t ignore it. first, be honest with yourself and make any necessary changes that you need to make. then, look for deeper issues in the relationship that need work. if you are not successful, seek help. i always say, we go to the doctor to repair our broken body, we should be willing to do the same when we need help with a broken heart, spirit or soul. the options range from prayer and wisdom, a trusted counsellor, or when necessary a professional. love is not jealous…it should not burn holes in your heart nor mine….it should not eat at us like cancer. love should contain a healthy respect for who you and i are as well as the one we love. cultivating seeds of love, like patience and kindness (as a start), will help us to recognize the weeds that appear, such as envy and jealousy. we can address them quickly before they take root and produce painful results in the heart. thank you for joining me today. it’s wonderful to have you stop by. my heart is to share some helpful wisdom to make your journey a little easier. i hope you have enjoyed the blog. if you found this blog helpful, please share it with your circle of influence-friends, family, work mates. open a dialogue focused on building stronger relationships with real love as the foundation. make the part of the world you live in a better place.